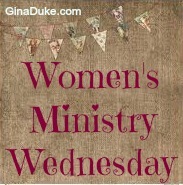 Continuing on with our current third Wednesday night feature, “Experiencing God Around the Kitchen Table” at my church for women’s ministry, we will be focusing on prayer. This is a topic near and dear to my heart. Earlier this year, I took Ms. Blackaby’s book and began a scripture study with my Wednesday night class. Every third Wednesday night we highlight a chapter and then add an interactive piece. To see some of those fun activities, check out our Pinterest board. I started sharing my journey here. The sixth chapter’s title is The Necessity of Prayer. “Reading and learning the Bible go hand in hand with prayer. The more you understand about the Lord through reading the Scriptures, the more you can experience of Him in prayer. The Holy Spirit uses Scripture in our lives to instruct and guide, often bringing special verses to mind in times of difficulty or as an answer to prayer. If we aren’t familiar with Scripture or we neglect time in God’s Word, our prayer life will never achieve the fullness God intended it to have. “ (p. 122) Marilyn Blackaby. Ms. Blackaby generously provides us some wonderful and funny little peeks into her prayer life. 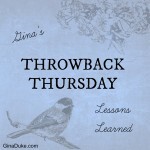 Through her stories, such as when at the right time she interceded for her sons, just as they were sliding on ice in front of an eighteen wheeler, we see the power and importance of prayer. 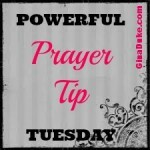 “Pray constantly” 1 Thessalonians 5:17. As such, we set up some prayer visual aids for the women to consider adding to their home or office. You’ve seen these chicken-wire window sills for sale at vintage fairs, I am sure. 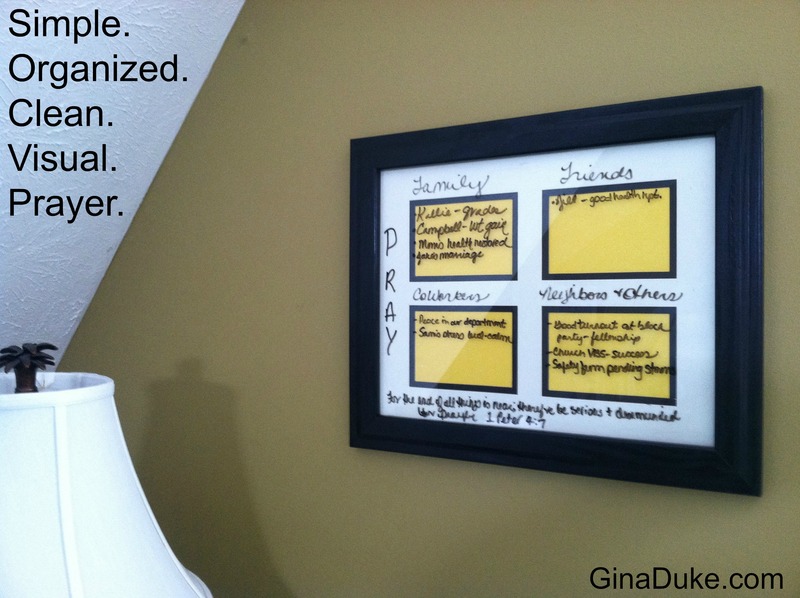 Consider using one as a family prayer board / station, encouraging your brew to use it throughout the day or week. 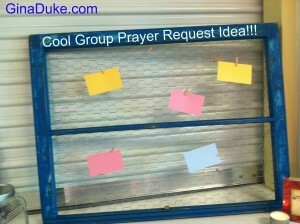 You could even use it at a women’s event / prayer room, too. One of my colleagues liked having a small white board hanging on the wall beside her desk where she could list her top 3 to 5 things to accomplish that day. From her inspiration, I took a photo frame that was sectioned, and made categories for prayer. Then I added some prayer requests. I hung it over my desk so I will remember to pray over these things throughout the day. Use a dry erase marker. 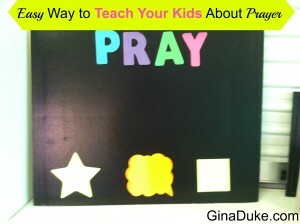 I created this prayer board to show moms how to teach their kids that prayer is about more than petitions. Using post-it notes shaped in a square, comments bubble and a star, you can correlate them to petition, hearing God and praise, respectively. 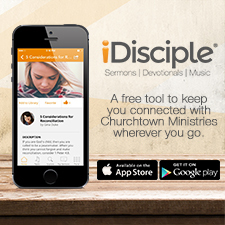 You can help your child write out a praise, petition or something they feel the Lord is speaking to their heart. You can see how this will develop a child’s overall understanding of prayer. I gave this particular poster board away to one of the moms in our class. She just told me this past Sunday that her daughter loves it. When she walked by her daughter’s room the other day, she overheard her telling her guest that she, too, could use her prayer board. Feel free to use this book or another to impart scripture and ideas for authentic Christian living to your ladies, and I hope you will share them in my comments section. Award-winning author Gina Duke is a wife, mother and Director of Women’s Ministry at her local church. Gina is also a speaker with a B.S. in Organizational Leadership. She is able to bring a clear word for authentic Christian living. Through her book, “Organizing Your Prayer Closet: A New and Life-Changing Way to Pray” (Abingdon Press), she imparts 1 Peter 4:7 with the gift of structured prayer journaling. Ms. Duke also blogs and offers numerous videos and resources at GinaDuke.com. You may also follow her on Twitter and Instagram @TheGinaDuke. 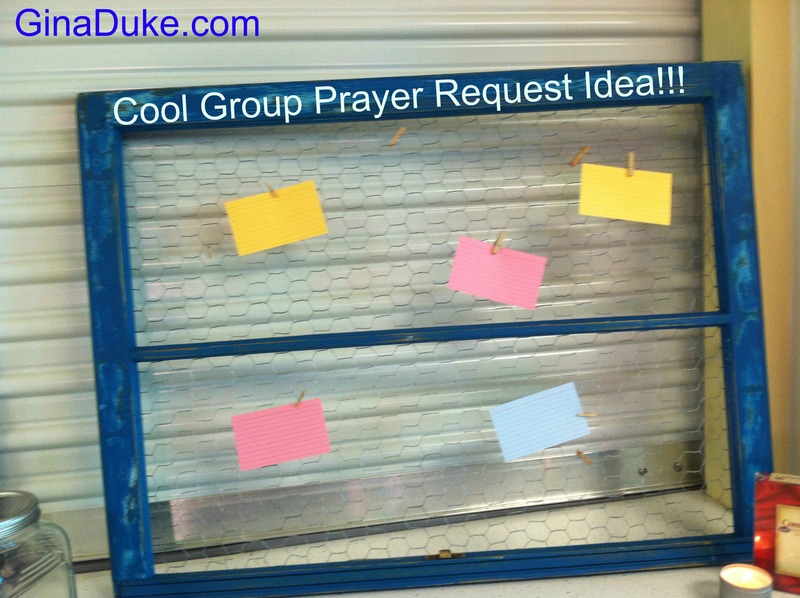 Love the chicken wire idea idea to hang prayers or prayer requests from!